My husband Bill desperately needs your help. Bill’s long battle with kidney and liver disease (he has been on dialysis for over six years) has resulted in him needing a double organ transplant to survive. We’re asking our family and friends to help us through Help Hope Live, a nonprofit that will help with the crucial expenses during and after the transplants. While my insurance and Medicare will cover the actual surgeries, Bill will need constant care after the surgeries, and we will be required to stay in or near Cleveland for eight to 12 weeks following these complicated and difficult procedures. While my work has approved my time off for this, it will be unpaid leave. Bill and I already struggle financially due to his illness and him being unable to work. His frequent hospitalizations as well as several other setbacks have completely depleted our savings. We will need to pay all of our normal bills and mortgage during the time of his transplants, as well as our expenses in Cleveland, including our lodging. We will have very little income during the time I will be off work, and we need your help. Donations to Help Hope Live will ease our financial burden and provide critical care to Bill. Bill was born in Cadillac, Michigan to Glen and Maureen Moore. When he was two years old they moved to Bear Lake, Michigan. Bill has an older brother Dan, and a younger sister Sue. Bill graduated with two associate’s degrees from West Shore Community College in Scottville, Michigan. Bill worked with his father at Bear Lake Marina for a few years and then worked for Townline Unlimited, the company that runs the Bargain Barn in Manistee, for 18 years. Bill and I met thanks to mutual friends. Bill’s friend Jeff was dating Deb from Tecumseh and Bill visited there to assist her with some home repairs. In return for his help he asked for an introduction to a woman as, according to him, they were “scarce in cold Northern Michigan.” Deb and Patti worked with me and invited me to a harvest party at Patti’s church on October 3, 1998. Jeff and Deb brought Bill along without telling me. Bill had Deb deliver a handmade card and an orange balloon sculpture bear to me on Monday, October 5. We then began a long-distance telephone and email relationship with the occasional weekend visit. We got engaged on December 31, 1998 and got married on the shores of Bear Lake on the Moore family property on July 24, 1999. Bill worked for Sears in Adrian, Michigan as a sales associate in the hardware and lawn and garden areas for several years until the store closed in early 2012. Standing on the cement floors aggravated the arthritis and bursitis in his right hip, and that summer he saw a doctor who prescribed the anti-inflammatory drug Mobic. He took this medication for 2-1/2 months. He started feeling awful and gaining weight. He went into the hospital on December 15, 2012. Doctors determined the drug Mobic caused his kidney failure. We considered a lawsuit against the makers of Mobic and the doctors, but there are no guarantees with a lawsuit and kidney failure is one of the possible side effects indicated. A lawsuit can also take many years to resolve and can deplete resources that are already stretched thin. Bill and I trusted doctors to know what medicines to prescribe, and that the prescription would work without causing further issues. Now, we are much more cautious about taking any medication. At the time of that hospitalization they also told him there was “something” going on with his liver. He was placed on dialysis at the hospital and in early January after having been released from the hospital, started dialysis at Davita Dialysis in Wauseon, Ohio. His unemployment benefits ended in December 2012. He was able to get Social Security Disability benefits during 2013, based on his hip injury. He never returned to work. Bill also needs a procedure called paracentesis where a 10 inch needle is used to remove ascites fluid (this is fluid build-up due to a liver failure). He was hospitalized for low blood pressure in December 2017 and was told at that time that he would likely need a liver transplant as well as a kidney transplant. He developed an infection in the ascites fluid in early 2018 and received IV antibiotics. He was hospitalized three more times in 2018. Bill has dialysis three days a week for five hours at a time. He often feels nauseated. Dialysis makes him tired and very cold. His hip injury has only gotten worse. He also has some arthritis as well as muscle spasms caused by dehydration and the dialysis process. Bill has frequent muscle spasms in his legs and back and his mobility is limited. He had a colon resection due to some polyps and a hernia repair operation in 2013. He has had two hernia repairs since then also. Between those surgeries and the insertion of a fistula in his right forearm for dialysis access, he is limited to lifting no more than 8 pounds. As a result of all these limitations due to his health, I work full-time and do all the housework and yardwork, lifting, carrying, cleaning, driving, etc. for both of us. In September 2018, we spent a week at Cleveland Clinic for transplant evaluation. His case was deferred to December 2018. We returned to Cleveland Clinic on December 13, 2018 for further evaluation. The Liver Transplant Team met on December 14, 2018 and approved Bill for Liver Transplant. The Kidney Transplant Team met on December 21, 2018 and approved Bill for Kidney Transplant. His case now goes to a state level team and upon that approval, the case will be reviewed once more by the insurance companies. The kidney transplant could happen in the same week as the liver transplant or it could be a totally separate surgery several months later, which would mean two extended stays in the Cleveland area. Along with our family and friends, we are raising money for the nonprofit Help Hope Live to fund uninsured medical expenses associated with transplantation. WOW! 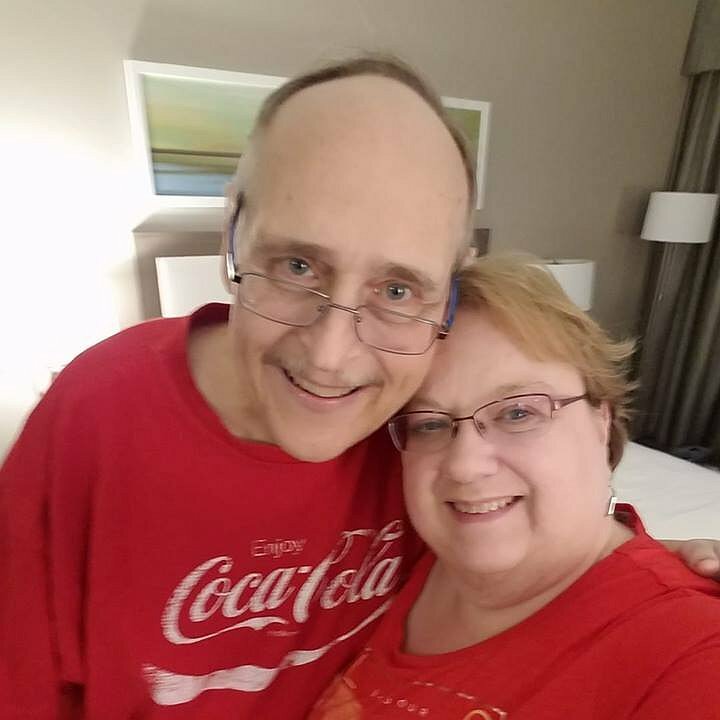 Bill got a call at 2:30 am on February 14, 2019 to get to Cleveland Clinic for transplant. He had a liver transplant on February 15th. He had a kidney transplant on February 16th. He is doing great. Both the liver and kidney are working good. He will soon be moving to a rehab facility. It is official! As of 1/4/19, Bill has been placed on the transplant list for both liver and kidney! Hoping for a quick match & great outcome! Praying and pulling for you!